DUI: An Overview | Cook County, Illinois DUI Law Lawyer The Davis Law Group, P.C. Contact Chicago Summary Suspension Law Lawyer The Davis Law Group, P.C. The DUI defense attorneys at The Davis Law Group, P.C. represent clients throughout Illinois and the Chicagoland area. The following is an overview of the Illinois DUI law and Summary Suspension law intended for informational purposes. If you are charged with driving under the influence, contact us directly to discuss the specifics of your case. Generally, there are two parts to every Illinois DUI case. The first part is the Illinois Summary Suspension law (driver's license suspension) and the second part is the criminal charge of driving under the influence. The Illinois Summary Suspension Law provides that when a person is arrested for DUI he or she consents to submitting to a breath, blood or urine test. The law provides for various lengths of driver’s license suspension if the person either fails testing or refuses to submit to testing. In order to determine the length of driver’s license suspension, it is necessary to determine if the person is a first or multiple DUI offender. Under the law, if the person does not have a prior DUI disposition within 5-years of the current arrest, they are considered to be a first time DUI offender. A prior DUI disposition may include a prior supervision or conviction for DUI, a prior supervision or conviction for Reckless Driving (typically reduced from a DUI charge), or a prior summary suspension arising out of an earlier DUI arrest. DUI offenses that occurred in a state other than Illinois are included. If the person is a first offender, meaning the person does not have a prior DUI disposition within the 5-year period prior to the current DUI arrest, the person’s driver’s license will be suspended for a period of 6 months if the person submits to and fails testing. If the person refuses testing, the person’s driver’s license will be suspended for a period of 12 months. If the person is a second offender, as defined above, the person’s driver’s license will be suspended for a period of 12 months if the person submits to and fails testing or 36 months if the person refuses testing. In all cases the suspension will take effect 46 days from the date the police officer serves Notice of Summary Suspension on the driver. Generally, this 46-day period will run from the date of the DUI arrest (unless the arrest occurred shortly before midnight when testing or refusal to submit to testing does not occur until the following day – post-midnight) except in the case of blood or urine testing. Where blood or urine testing has occurred, the suspension will not begin to run until 46-days following service of the notice of summary suspension, which cannot be completed until test results are received by the police officer from the State laboratory. The police officer will file a copy of the Notice of Summary Suspension with the Illinois Secretary of State and the Secretary of State will then, in turn, mail a Confirmation of Statutory Suspension to the driver. The confirmation will indicate whether or not the person is a DUI first offender for summary suspension purposes, the effective date of the suspension, and the length of suspension. Whether the driver had submitted to and failed testing or had unlawfully refused testing. The hearing must be conducted within 30 days of the filing of the Petition to Rescind or on the first court appearance date set by the police officer on the DUI, whichever is later. Failure to conduct the hearing within that time period may result in a rescission (removal) of the suspension, unless the delay in conducting the hearing is occasioned by the driver/petitioner. If the court makes a determination in favor of the driver on ANY of the above issues the court will order that the summary suspension be rescinded. If the court determines that the driver has failed to prove at least one of the above issues the suspension will be sustained. It should be noted that the burden of proof in a summary suspension hearing is on the driver to establish at least one of these issues. If the suspension is not rescinded and the driver is a first offender as defined above, he or she may apply for a Monitored Device Driving Permit (MDDP) from the date of entry of the statutory summary suspension. If the person is not a first offender, then he or she may apply for a Restricted Driving Permit (RDP) through a hearing with the Illinois Secretary of State. Generally, in Illinois, DUI is charged as a Class A misdemeanor, punishable by a maximum of 364 days in county jail and a fine not to exceed $2,500.00 plus statutory court costs. In certain situations, a DUI may be charged as a felony. A felony is defined as any offense, which carries as a penalty a period of incarceration in excess of 364 days. 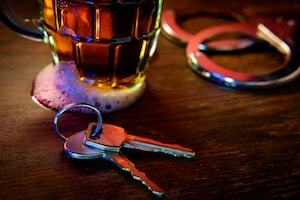 One or two DUI citations are typically issued as a result of any DUI arrest. This usually depends on whether the person submitted to and failed testing (breath, blood or urine). If the person submitted to and failed testing a ‘per se’ charge will be filed, which means that by virtue of the test result the person is presumed to be under the influence. In these cases, a second DUI charge will also be filed, which simply alleges that regardless of the test result, in the opinion of the police officer, the driver was under the influence. In cases where the driver refused testing, a ‘per se’ charge cannot be filed and only the one DUI charge will be filed. The person is involved in a accident involving great bodily harm, permanent disability or disfigurement as a result of the DUI. At the time of the DUI the person had previously committed the offense of reckless homicide where intoxication was an element of the offense or the person had previously been involved in an accident that resulted in great bodily harm, permanent disability or disfigurement as a result of the DUI. With certain exceptions, felony penalties can range anywhere from 1-3 years to 6-30 years in the penitentiary and up to a $25,000.00 fine plus statutory court costs. In the criminal DUI case, it is the prosecutor’s burden to prove that the person was driving a motor vehicle or in physical control of a motor vehicle while under the influence beyond a reasonable doubt. The only exception is that DUI may be charged where the person has a controlled substance in his or her system without regard to impairment. It should be noted that the fact that a person was legally prescribed and permitted to use a prescription drug(s) is not a defense to a DUI charge. If the person is convicted of DUI there are various driver’s license penalties that may be imposed in addition to the summary suspension of the person’s driver’s license. Under Illinois law, a person who has been convicted of one DUI will be revoked for a minimum period of 1-year; 2 DUI convictions (arrests occurring within a period of 20-years) will be revoked for a minimum period of 5-years, and those with three DUI convictions will be revoked for a minimum period of 10-years. These persons may apply for a restricted driving permit during the revocation period. Those with 4 or more convictions with the last DUI arrest occurring after January 1, 1999 will be revoked for life. However, the person may apply for an RDP through an administrative hearing with the Illinois Secretary of State after a period of 5-years from the date of revocation or release from prison/jail (whichever is later). If the person is an out-of-state resident, then he or she may apply for full reinstatement after a period of 10-years from the date of revocation. The Secretary of States Office conducts administrative hearings for those drivers who are revoked for DUI. These hearings are complex and difficult. An experienced attorney’s representation is highly advisable for those seeking relief. The DUI defense attorneys at The Davis Law Group, P.C. routinely represent clients charged with DUI throughout Illinois including Cook, Lake and DuPage Counties. The principal of the firm, attorney Larry A. Davis, is a co-author of the Illinois summary suspension law and the Illinois MDDP law. Our lawyers strive to provide high-quality legal representation throughout all stages of representation. Contact our DUI defense attorneys to discuss your case.